This walk is somewhat spoilt by its approach. It starts with a steep ascent through the forest, blunders through an indeterminate bit, and then ascends a scree-filled gully (map). Once past these lower obstacles, however, it is a delight, with a couple of interesting scrambles which give it its difficuly grade, an obligatory ascent of a fixed ladder in a cave, and a wonderful walk along the crest. From the car park follow the track trending south east for about 300 metres. When it reaches a positive summit, a thin track heads off uphill to the right. This starts off horribly steep, but the angle soon eases. After about half an hour, the path intersects a contouring forestry track. Ignore it and carry on, taking the right hand option after a few minutes. This should then be followed to a positive ridge. By this time, you will have picked up the occasional blue blobs and red arrows. The path loses its identity on the ridge, but find your way up it until a clearing, rampant with man-eating Giant Yellow Gentians, is reached. From here, there is a fine view of the l'Aulp du Seuil basin above the Guiers Vif cirque. The next part of the route is a bit of a mystery, as we have never found the right bit of path, but the following works after a fashion. Go to the top of the clearing into the woods, and ascend this until you are 20 metres higher than the clearing. When you can, traverse to the left (north) until you leave the wood for some scree. Keep your eyes open for a path coming up from below, but don't panic if you don't find it. Keep on traversing to the north until there is a distinct gully above you, with a rocky amphitheatre seemingly half way up. This is the gully you need to ascend. There is no path up to the amphitheatre - make your way up the steep scree-covered slope as best you can for about quarter of an hour. The rock wall may be climbed well over to the right, where way-marked. This is a slightly awkward scramble of some three or four metres (Difficulty 2), which is not recommended for descent. A rope may be useful for those lacking confidence on rock. From here, a distinct path wanders easily up the shallow gully, taking in one or two rocky steps on the way, to the entrance of a small cave called la Trou de la Saignerie. Enter the cave, and climb the iron ladder, installed in 1939, which leads through a small hole in the roof. 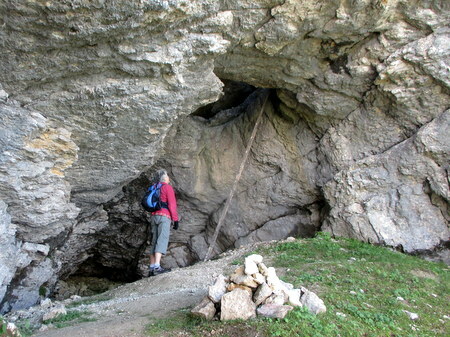 From here, a short shelf takes you back to a narrow, but short, traverse above the cave entrance (slight exposure). Continue ascending up the gully to a crack. This is an awkward, but not exposed, scramble which is a lot easier if rucksacks are taken off first, and passed on up. Once at the edge, follow one of the two paths that go north to le Pinet - the one nearest the crest is the most fun. It's a glorious flower-strewn path, with fantastic views on both sides. The summit with its cross is reached after about 40 minutes. As one would expect, the views from the summit (1867 m) are outstanding in all directions including a view of one of the 2016 landslips on Mont Granier, and a aerial view of la Plagne below the sheer 400 m cliffs. It's a wonderful place for lunch, and tends to be less frequented than the main tops of Chartreuse.